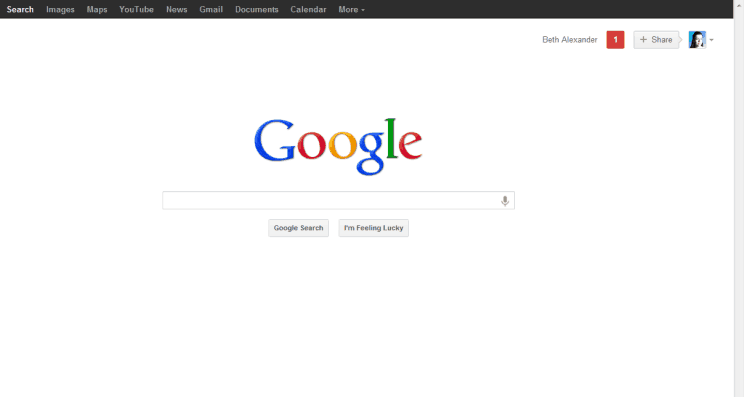 Notice anything different today about Google’s patented search page design? A new Google+ Share button now appears in the top right corner. If you don’t yet see the button, have no fear it is being rolled out to all users this week. While this may seem like a minor update, it is the first time the Google homepage itself has included any functionality other than search. Personally having the Google+ share button on the search homepage doesn’t make sense to me from a user perspective. Why would I go to the search homepage to share something with my Google+ network? And that’s not the only design change in the works. In November of last year Google announced plans to roll out a complete makeover of the Google Bar as seen in the video below. But they quickly reverted back to the old design. Clearly they are still searching for ways to get more traction for Google+ and improve accessibility for users. This redesign is slated to roll out “over the next few weeks”. You can read more about the new Google bar here on the Google Help site.